Prawns. I love ’em. Can’t get enough of ’em. I suppose it is because I don’t eat them as often as I would like. Not the cheapest of seafood choices out there, now are they? So when I do get my hands of some I savour them and rarely share. It’s a good thing then that R is not a fan of prawns. Yay for me! This recipe seems a no brainer. All it really is is the combining of several already cooked components and you will have a smashing good salad in no time. I recreated this salad based on a store bought salad actually. I must say, the Netherlands sells the best pre-packed supermarket salads ever. Fresh fresh ingredients, generous portions and low prices. And they all come as a balanced meal, with a portion of carbs, a portion of protein and 2 portions of veggie in every pack. So I came home and decided to replicate one of my favourite salads on the supermarket shelf and to see if I could make a cheaper version at home. I started off with some prawns which were already cooked and chilled. These did not come cheap, about € 3. Off to a bad start already. Then some salad leaves of your choice ~ I just picked a bag of mixed leaves (the non-bitter kind). Some radish. Wok noodles. Sesame seeds. 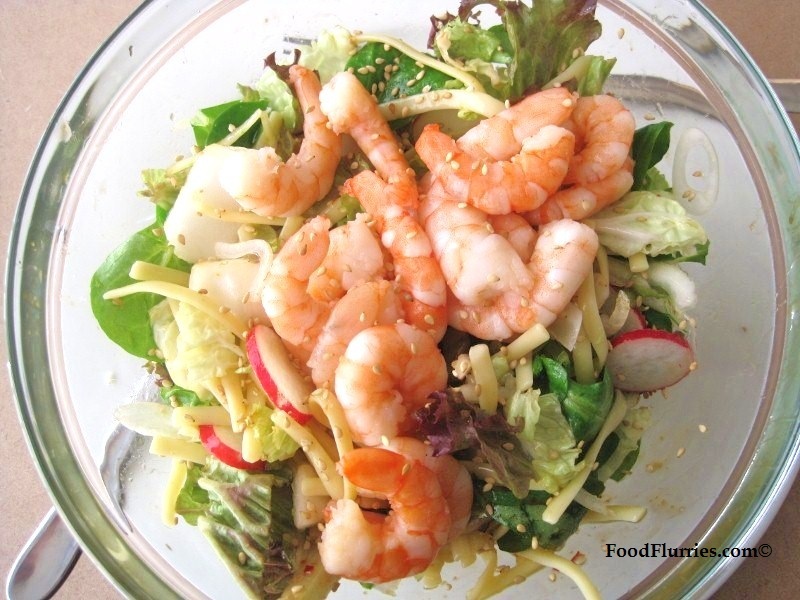 You may need to wash and rinse your wok noodles prior to adding it to your salad to get rid of some of the excess starch and oils. Allow them to drain completely in a collander over the sink while you arrange the rest of the salad. Thinly slice radish and toss among the salad leaves. Be sure to get rid of any wilting leaves. Add in the noodles and sesame seeds. For the sauce, all you need is a bottle of Thai sweet chilli sauce, sesame oil and maybe a drop or two of fish sauce for a hint of saltiness, and some lime juice. Combine everything in an empty jam jar, slap on the lid and shake vigorously. Finely chop coriander leaves and add to the dressing. Pour over the salad and toss lightly. 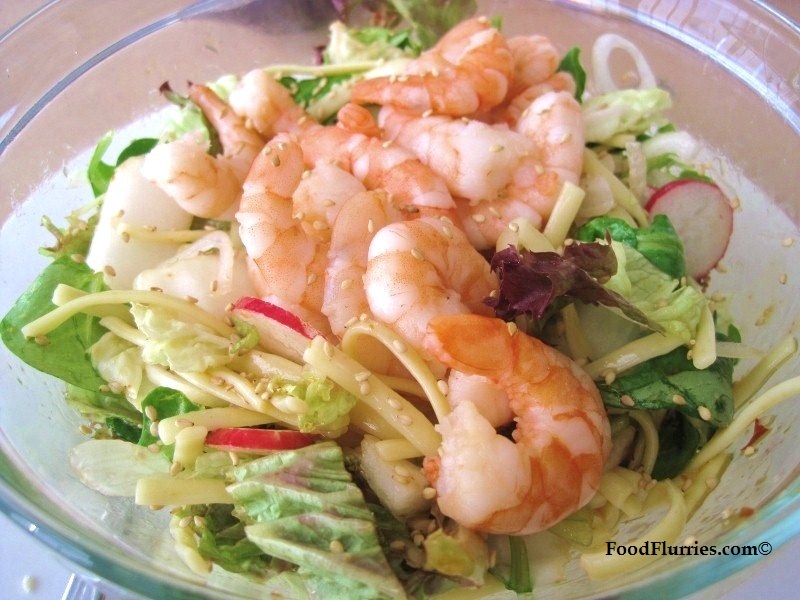 Arrange the prawns on top and you have a perfectly good salad in minutes. For an additional zing, for all those chilli addicts, try adding in some finely chopped fresh chilli and mix in with the dressing. I am not a fan of overly spicy food anymore. My taste for all things firery and hot has deminished since I left home a decade ago. I like herbs and spices and robust flavours, but I no longer enjoy chillies all that much. My mother would disapprove. Lol.